Redbet are giving up to 50 free spins on each of the following NetEnt slots: Creature from the Black Lagoon, Gonzo's Quest, Starburst, Twin Spin and Secret of the Stones. Take the chance to try your favourite slots in Casino Red for free, and keep the winnings! Winnings from no deposit welcome free spins limited to 100 euros per player. All winnings must be wagered 40x before they can be withdrawn as cash. 50 free spins limited to Sweden, Norway, Finland. 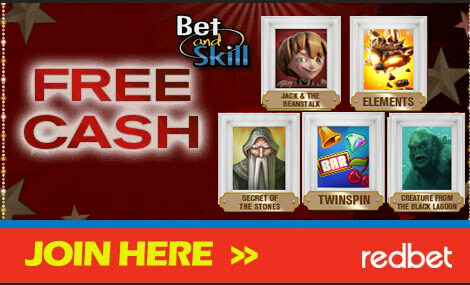 25 free spins limited to UK, Ireland, Germany, Poland, Russia and Netherlands. Redbet reserves the right to alter or cancel this offer at any time. 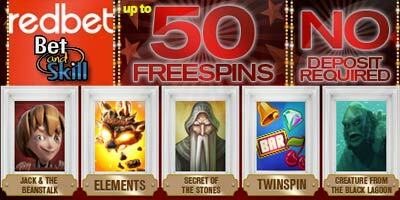 "Redbet Casino: up to 50 free spins without deposit"